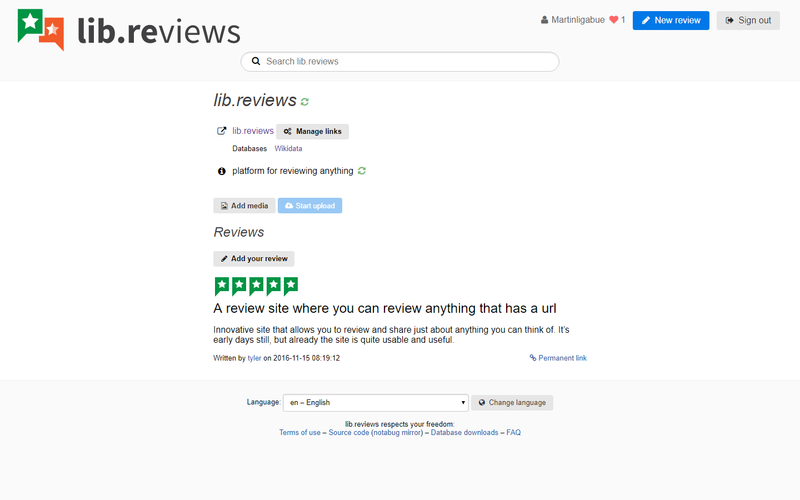 lib.reviews is an open platform to post reviews and a one- to five-star rating on basically anything. Anything with a URL, that is, and sensibly you are not allowed to review individual persons unless they act as a business. The system is actually pretty clever: every review is attached to an object, which is identified by one or more URLs. And if the URL points to a supported source — at the moment primarily Wikidata — the system will automatically pull in metadata such as a description from the data source. I believe the future for Internet reviews should lie in decentralised networks, either federated (e.g. using ActivityPub) or fully peer-to-peer (e.g. built on top of Secure Scuttlebutt). But lib.reviews, by being open source and open data and being available in the here and now, can be an important first step towards that goal: by being open source, the platform itself can evolve towards enabling decentralisation. And even if it doesn’t, by being open data the reviews posted on lib.reviews can form initial content for any future platform. Why let your reviews be kept hostage by others? I like writing reviews. I like helping out others in discovering new bars or restaurant, avoiding tourist traps or crappy products and in general discovering cool new stuff. However, it has always nagged me that I am really writing for free for those huge corporations that then go on to sell ads (or apply, as with for example Yelp, even shadier business tactics) next to my reviews. So, for me at least, lib.reviews is the solution: Not only can you review everything that has an URL (which, let’s face it, today is basically anything), but your reviews will be published under an open license so that everyone can freely download and benefit from them (similar to Wikipedia or OpenStreetMap). And by integrating with open data sources such as Wikidata or (hopefully in the future) OpenStreetMap, the reviews will be tied into a vibrant, open and truly free data ecosystem. Lib.reviews è un sito che ha delle ottime potenzialità, sono appena arrivato su questo progetto e spero che migliori nel tempo sempre di più. Innovative site that allows you to review and share just about anything you can think of. It’s early days still, but already the site is quite usable and useful.